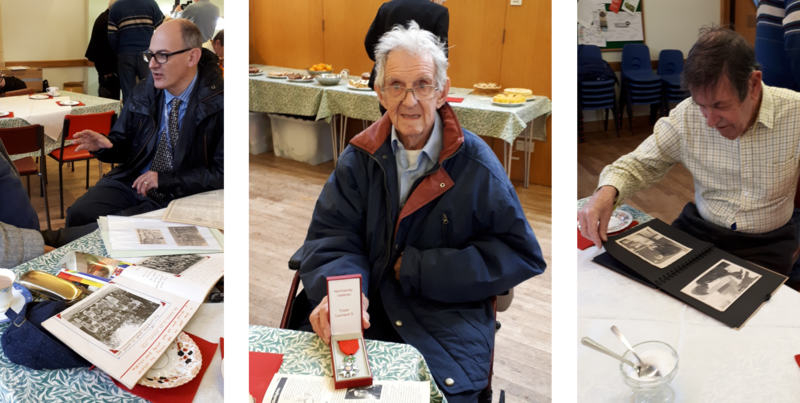 Snack, Chat and Reminisce was an event supported and funded by LinkAge Network that started the celebrations of Sea Mills 100th birthday. It took place on Wednesday 28rd November with the support of Sea Mills 100, Sea Mills Primary School and a handful of amazing volunteers. 52 people attended, more than any of us ever imagined. There was a combination of people; those who brought photographs to share, those who met neighbours and friends that they hadn’t seen for years, children from the local primary asked questions about those living Sea Mills, the local play leader that used to run the playgroup sharing memories and photographs, an older man of 93 sharing his stories about his war medal, and then there were those people who came for the tea and cake. The hall at St Edyths Church was buzzing with activity and noise. The aim of the day was to collect stories, photographs of people’s lives in Sea Mills and to also talk about the things people used to do and what they would like to do now. Children from the local primary school asked people what games they used to play and people said that they used to play marbles, hop scotch, skipping, board games and football, one person fished for eels, others explored the woods and played in the street. One person even said that they “dug to Australia in their backyard”. Exhausted and happy to eat the last bit of cake, overall an exciting time was had by all.